Here’s another in the series of iPhone games that make you get high. Elevation that is. 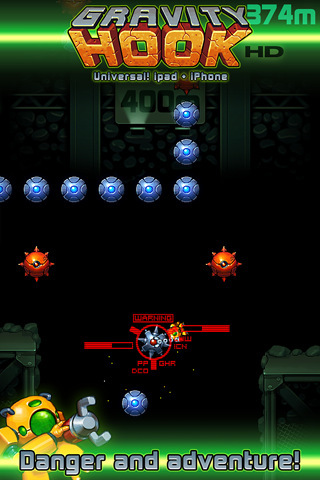 Gravity Hook HD is the newest game from the team that made Canabalt. It’s basically an endless climbing iPhone game using hooks. Your guy is a little robot that has a chained link rope that contracts and expands. Your guy uses to clim from one pod to another as he climbs up, avoiding obstacles along the way. The layout of the pods changes from game to game, to keep things interesting and challenging. 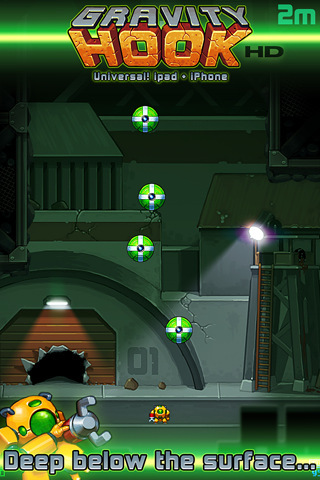 Gameplay involves tapping on the various pods just at the right time to toss and hook your guy and keep him from falling to his death. Timing is crucial in Gravity Hook. Wait too long and the elastic chained rope loses its bounce power and you’ll break off and die. Or if you lose proximity with the next pod, your hook won’t pull you up, and kaboom you’re dead. As you get higher, you’ll run into bomb pods that will explode after a few seconds, so you can’t be attached to them for very long, and you surely can’t hit them on your way up. Gravity Hook HD has colorful sharp graphics and a hypnotizing midi soundtrack to keep you entertained while you try to get your score higher each time. Scoring is based solely on meters climbed. GameCenter integration lets you see high scores in the thousands, which can make you quite envious. If you love these type of endless games, Gravity Hook HD is a good buy. If you have an iPad, you also get it there, thanks to the universal binary, which might help explain the 3 dollar price tag. Be sure to also check out Canabalt and HookWorld. AppSafari review of Gravity Hook HD was written by Joe Seifi on December 24th, 2010 and categorized under App Store, Fun, Games, iPad apps, Platformer, Universal. Page viewed 3509 times, 1 so far today. Need help on using these apps? Please read the Help Page.